PRORECK FREEDOM 15 Portable 15-Inch 800 Watt 2-Way Rechargeable Powered Dj/PA Speaker System with Bluetooth/USB/SD Card Reader/ FM Radio/Remote Control/Wireless Microphones/Speaker Stand by PRORECK at IGWT. MPN: FREEDOM 15. Hurry! Limited time offer. Offer valid only while supplies last. Enjoy your social gatherings with our full-featured active speaker. It is great for DJ, anniversaries, backyard weddings, home studios, speech, etc. Enjoy your social gatherings with our full-featured active speaker. 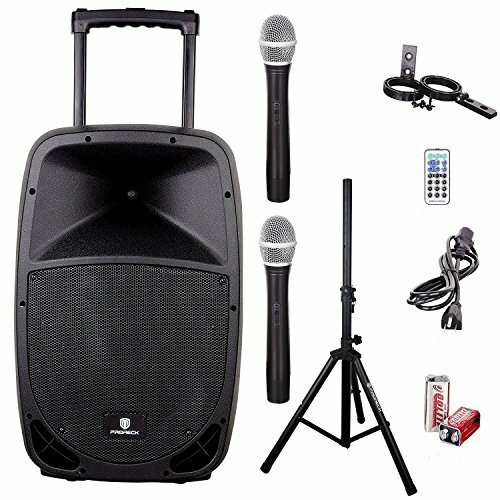 It is great for DJ, anniversaries, backyard weddings, home studios, speech, etc. With a built-in rechargeable battery, this portable system is perfect for indoor and outdoor activities. The FREEDOM 15 features Bluetooth /USB/SD Card Reader/ FM Radio functions, allowing you to enjoy the versatility of this unit. By simply connecting your phone to the speaker via the Bluetooth, plugging in a SD Memory Card or a USB flash drive, you can enjoy your favorite audio files. The FM radio also allows you to listen to your favorite radio station. More attractive, the FREEDOM 15 has a LCD display clearly indicating the mode you choose with the remote control function allowing you to switch the mode when you are far away. The FREEDOM 15 is equipped with a XLR and 1/4"Mic Inputs for balanced and unbalanced Mic separately. It also has a stereo RCA Line input and output. With a telescope handle and two transport wheels at the bottom, you can easily move the speaker anywhere you want with only a little effort. Thanks to a 35-mm pole socket, you can mount into the included speaker stand for a better stereo experience. 5 smooth rotary knobs enable you to easily control the master volume, Mic, Line/MP3, as well as echo volume.